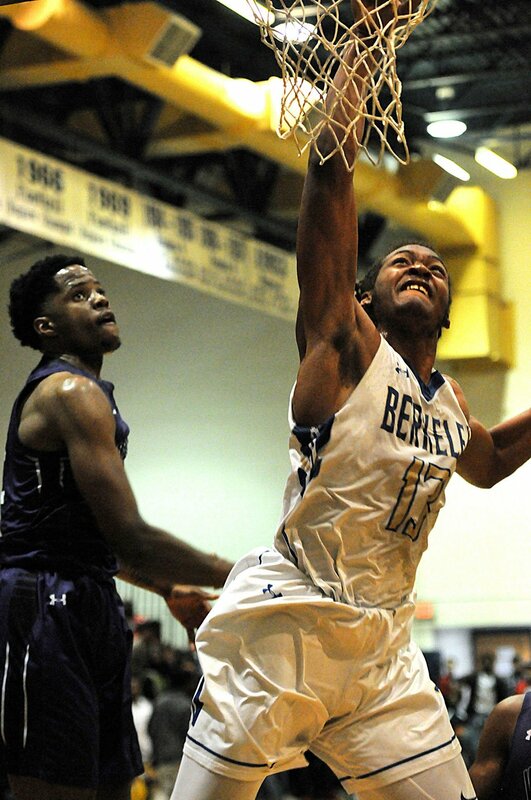 Berkeley's Ishan White attempts a dunk in the first half against West Ashley in the Class AAAAA playoffs Tuesday. Berkeley's Berkeley's Trevur Smalls makes a layup in the first half against West Ashley on Tuesday. With apologies to all former Berkeley High basketball teams in the school’s long history, the 2018-19 version of Stags basketball will go down as the best in school history. This year’s team advanced to the Lower State championship in Class AAAAA with a resounding 72-52 over West Ashley on Tuesday night. The Stags (25-1) will face undefeated Lexington on Saturday night at 6:30 p.m. in the Florence Civic Center. The winner advances to the state finals the following week. It is believed to be the first Berkeley team ever to advance to the state semifinals. The electric atmosphere before a sold-out crowd was treated to an unbelievable third quarter. Trailing 36-31 at halftime, the Stags dominated the third quarter 29-1 and cruised through the final eight minutes. Berkeley put four players in double figures, led by senior forward Ishan White’s 19 points. Senior Trevur Smalls and Hakeem Meggett added 15 points each, while senior point guard DJ Chisolm scored 10 points. Chisolm, White and Smalls each scored baskets in the first 2:15 of the third quarter, pushing Berkeley to a 37-36 lead. The lead continued to grow as Chisolm drilled a pair of 3-pointers and White and Solomon Butler each hit from long range. By the time the quarter ended, Berkeley led 60-37. West Ashley closes the season at 19-8. Senior forward Devin Ramsey led the Wildcats with 13 points. Guards Jadon Moore and Kenyatta Jenkins added 12 points, and senior Peter Musci scored 11. In other state playoff action involving local teams, Charleston Math and Science saw its season end with a 60-51 loss at Bethune-Bowman. In SCISA girls playoffs, Porter-Gaud got 31 points from Elise Pearson and defeated Wilson Hall 62-58 to reach the Class AAA semifinals. Porter-Gaud will play Cardinal Newman on Friday night at the Sumter Civic Center. The other semifinal in Class AAA will pit area rivals First Baptist and Northwood Academy on Friday. First Baptist advanced with a 53-40 win over Florence Christian, while Northwood defeated Trinity-Byrnes 61-31. Northwood defeated First Baptist in both of their regular season meetings.